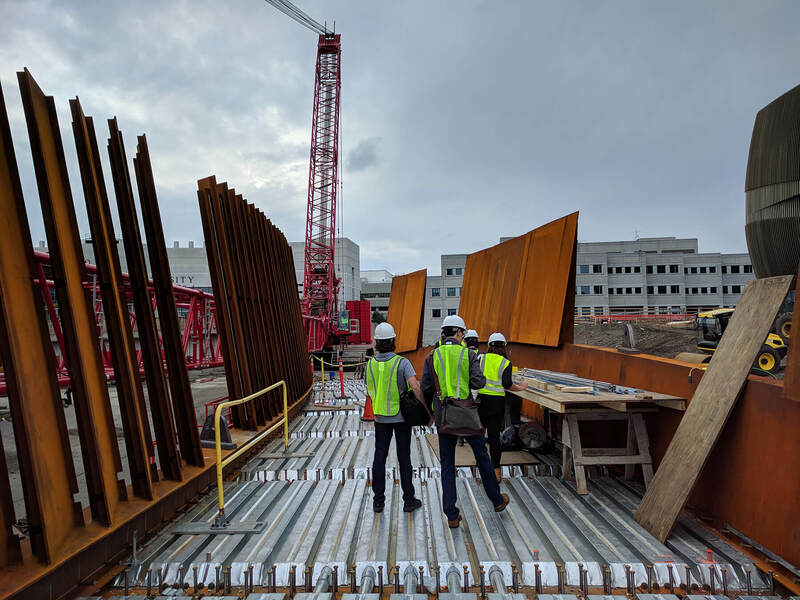 The Young Designers Core (YDC) recently had the opportunity to tour the site for the Pedestrian Crossing at Northeastern University. This is a unique and exciting project, located between the Interdisciplinary and Science and Engineering Complex (ISEC) and the future site for ISEC Phase 2. The bridge is scheduled to open in February 2019. It will serve as an important pedestrian link between the North and South sides of Northeastern’s campus as well as the surrounding neighborhoods. One of the most interesting and challenging aspects of this project is that the bridge spans over five active rail lines to connect the two parts of campus. To achieve this, the project team worked hard to pre-fabricate and assemble as many of the pieces as possible on site. This allowed for the two main bridge spans to be moved into place during two consecutive “picks,” which helps to minimize overall construction work over the tracks. 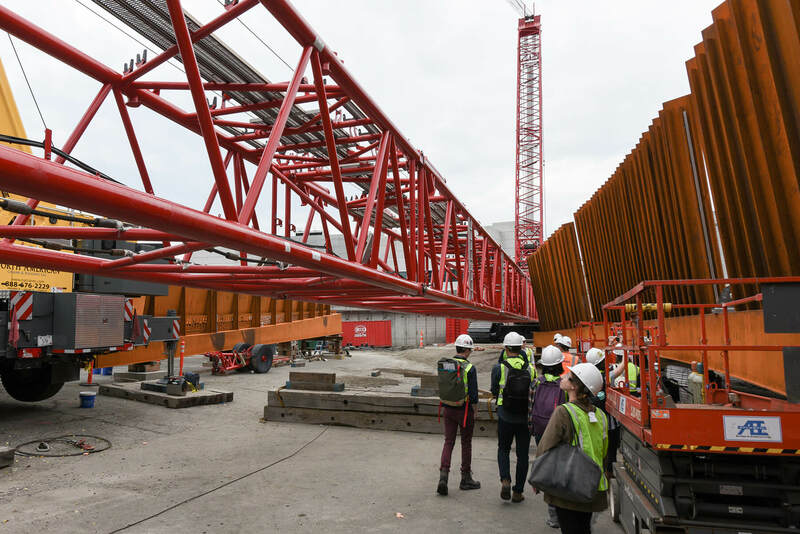 In preparation for the upcoming pick, a massive crawler crane arrived to the site in 33 trailer truck loads worth of pieces. A smaller crane was assembling this bright red Manitowoc MLC-650 crane (one of the largest cranes on the east coast) as we were touring the site. This giant crane lifted 240,000 pounds of steel, rotating it 180 degrees, moving it over the tracks and then gently lowering the span perfectly into place – all within a four-hour time frame. The amount of planning and coordination that goes in to making this run smoothly is incredible. The largest span was nearly ready for its pick during our visit, so we were able to walk that part of the bridge. The monumental parapet panels create a beautiful sculptural experience while crossing the span. When pedestrians first step on to the bridge, the parapets are angled in a way that creates the illusion of a solid wall. 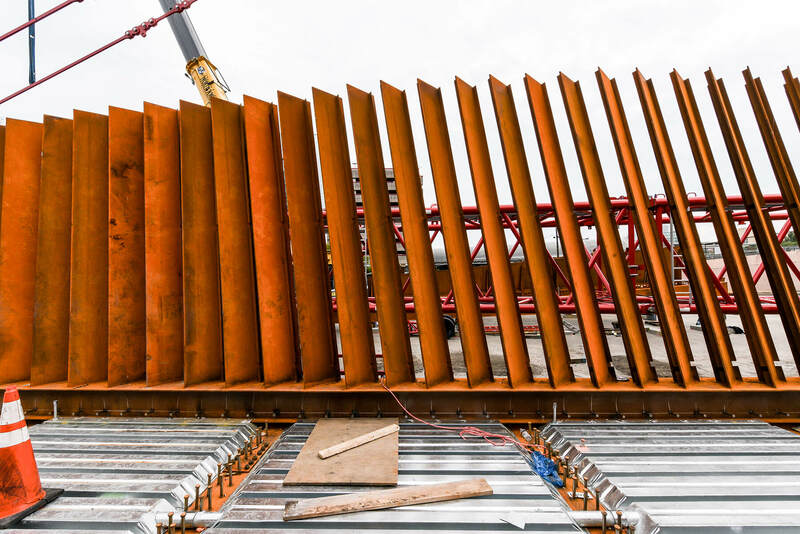 As pedestrians progress across the span, the angle of each panel is slightly more offset from the previous, allowing the “solid” wall to open up and become transparent. When the span is in place, these openings will be directing views to the Boston skyline and ISEC. This project serves as an example of how structure and design can come together to push the boundaries of a typical pedestrian bridge. It will be very exciting to walk across the bridge when it is complete this spring!